You go inside the colonia at daylight with the car’s windows lowered and your hands in sight. Strangers are closely watched by lookouts on the hill and at the street corners. You slowly find the way among the breeze block huts to a wasteland of rubble and shabby deserted buildings: la linea, the invisible border dividing the strongholds of the two main gangs fighting a turf war to control the barrio, Mara Salvatrucha – or MS13 – and Mara 18. Whoever dares to cross will never come back. Save for Dany Pacheco, the soft speaking evangelical pastor who’s getting me through. 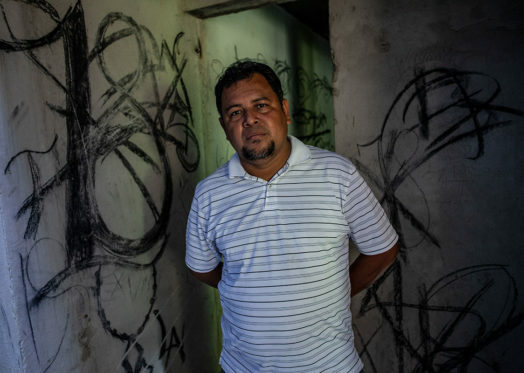 “It’s a battleground” says Pacheco, who lives with his family in the Rivera Hernandez neighborhood in San Pedro Sula and is respected by the pandillas for his tireless commitment to spare bloodshed. “This is the most violent sector of one of the most murderous cities in the world”. He takes me to the “mad house”, a two-story building at the edge of the slum, cleared out when it was caught in the crossfire. “Here is where sicarios torture and murder their victims” says the pastor, whose home is nearby. “Sometimes at night I hear the screamings. Suspicious police informers are cut into pieces with a chainsaw and dumped in the sewer”. The walls are scribbled all over: the gangs’ marks, the numbers, the slurs left by the military on a search sting. The floor is littered with broken glass, cigarette butts, iron cables. And stained by blood. “I want to convert this place in a outreach center for the community” Pacheco says. “The government doesn’t help and I don’t have money, but the people are giving something. We plan to set up a workshop and a women’s safe house. So many girls are raped in the barrio. But first we have to clean up. We are scrubbing the blood from the floors”. There are six gangs in Rivera Hernandez. They deal with drugs, work as sicarios for the narcotraficantes and extort quotas as impuestos de guerra. Everybody must pay for protection, and there are no exceptions. The dead show up daily to the morgue or just disappear. The body of 20 years old Rinaldo, who stepped on a wrong side in the infamous Casablanca neighborhood two weeks ago, has never been found. “I am sure they finished him” says the pastor. That’s why a growing number of people are fleeing Honduras: by bus, walking in caravans, running into debt to set the bill of the coyote who bribes the police, supplies the papers and sells the dream of a better life in the US. They are fleeing a rotten country, devastated by hunger, insecurity, corruption, drug trafficking, unemployment, unforgivable inequalities. “It’s getting worse” says the pastor. “See you when you come back, if I’m still alive”.